I am self-confessed Prosecco and Champagne fan – there is rarely a time that I cannot find an excuse for a few bubbles. When I came across this cocktail, I had to try it and given that about 5 minutes of preparation can make, quite a few drinks, I’m definitely an advocate. This drink requires a bit of advanced preparation, but will provide you plenty of supplies for future cocktails. Drain the cherry juice into a small saucepan (retaining the cherries) and add the thyme. Simmer over a low heat for 5 minutes. Put the cherries into a resealable jar, then pour the juice back over the cherries (having removed the thyme). 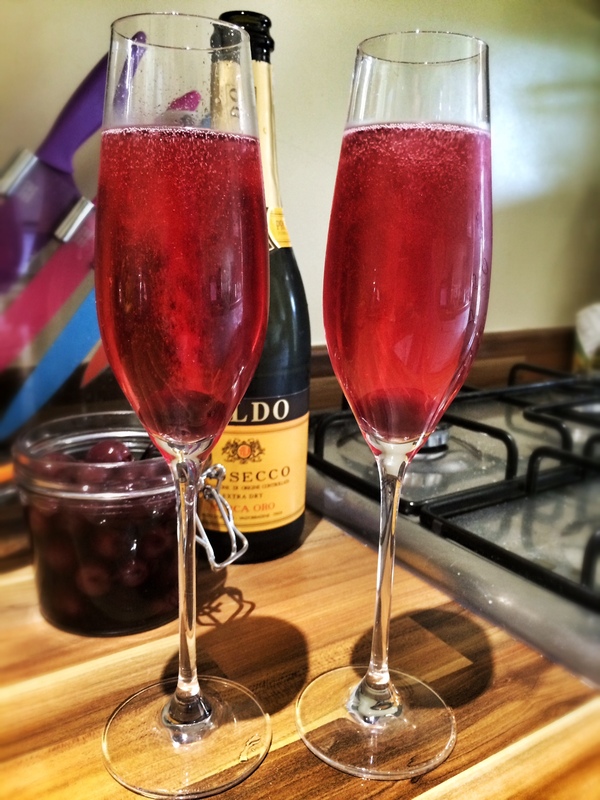 Once cool, put on of the cherries in a champagne flute, add 4 teaspoons of the cherry juice and top up with Prosecco. Give a spritz with a wedge of fresh lemon and you’re ready to serve.